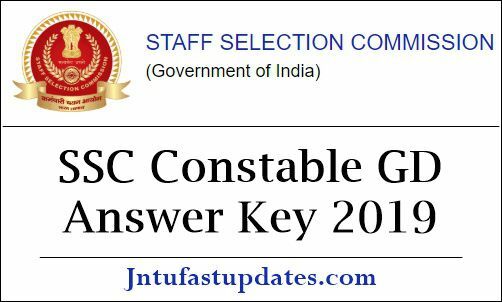 SSC GD Constable Answer Key 2019: Staff Selection Commission (SSC) organized the Constable General Duty written test on various dates from 11th February to 11th March. The written test round has been conducted in 297 examination centers across the nation and a total of 30,41,284 competitors appeared for the SSC GD Constable examination this year. The competitors who had appeared for the SSC GD Constable written test and waiting to download answer keys can visit the official website, ssc.nic.in. The answer key links will be soon activated to download on SSC portal. SSC will upload the answer key for all exams and for all sets (A, B, C, D). By downloading the answer sheet, competitors can compare with the corresponding set and estimate the score. Also, the competitors can download SSC GD Constable answer key from the attachments provided in this article. Staff Selection Commission yearly releases various job notifications to employ the manpower in various departments such as BSF, ITBP, SSB, NIA and SSF, Rifleman in Assam Rifles and CRPF. The SSC GD Constable notification 2019 has been released by the organization for various departments. Many of the eligible aspirants seeking to get central government jobs have applied for constable general duty posts. SSC shortlist the candidates purely on the basis of merit. Candidates have to qualify in written test, Physical Standards Test (PST), Physical Eligibility Test (PET) and Group Discussion round to get shortlisted for the SSC Constable General Duty posts. All the competitors who are waiting for SSC GD Constable Answer Key 2019 can visit the SSC official website, ssc.nic.in to download the answer key. As per the reports from the organization, it is planning to release the answer sheet/question paper solutions in the month of April (Tentatively). The answer sheet will be released for all the exams conducted on various dates and for all the sets given in the examination. The question paper solutions attachments will be uploaded in PDF format. By tapping on the corresponding links, aspirants can download SSC Constable GD answer sheet 2019. Answer sheet/question paper solutions are the useful document that lets the competitors check the correct answers, probable score in the exam, the chance of getting shortlisted for the next round, and various other aspects. Hence the competitors can wait to download SSC Constable GD Answer sheet PDF. Soon, we will provide the links to download the answer key on our portal. Provide the details like register number, password, etc. Tap on the submit button. The answer key will be downloaded in PDF format. Check with the corresponding set and estimate the score. Take a printout of the answer key for further reference. Sir 15 April ko kaha Gaya ki answer key aa jayega..Par abhi tak nahi aaya..